We can imagine HTC One owners in the US are beginning to lose patience (to put it nicely), as their European counterparts continue to receive the green light on the next iteration of Android Jelly Bean. As of today, if you own an HTC One and live in the UK or the Netherlands you should head straight to Settings → About → Software Updates → Check now and get the 416MB update OTA. Exactly when the new version will reach the coast of the US is yet unknown, but we imagine it's next in line. Fragmentation is all but gone post-ICS. i just did the update from the middle east, and it is amazing, it fixed my sound latency issue i had, well not 100% but now it is way better, finally no more ugly menu bar... now next, HTC don't be late on KLP please !!! You sir are an idiot. Bringing up fragmentation argument on an article about a HTC Sense update. Again. Update is upgrading Jelly Bean to Jelly Bean. What fragmentation? This update is all about HTC Sense 5 tweaks and patches. What? HTC left us using American unlocked version to wait till 2014 to get the piece this update. Slowest update ever from Taiwan, can't imagine Peter doing this to me. I think they're sending out the updates for the unlocked variants based on how much were sold in that country. I'm sure not many people bought the unlocked variants in the U.S, so that's at the bottom of their list. 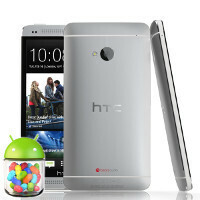 However, the U.S carrier versions sold a lot, and HTC probably already sent the update to the carriers to be tested. You'll still get your update before them, though.